APEX | Asian Professional Exchange » APEX Youth Education Summit – Join the Committee! 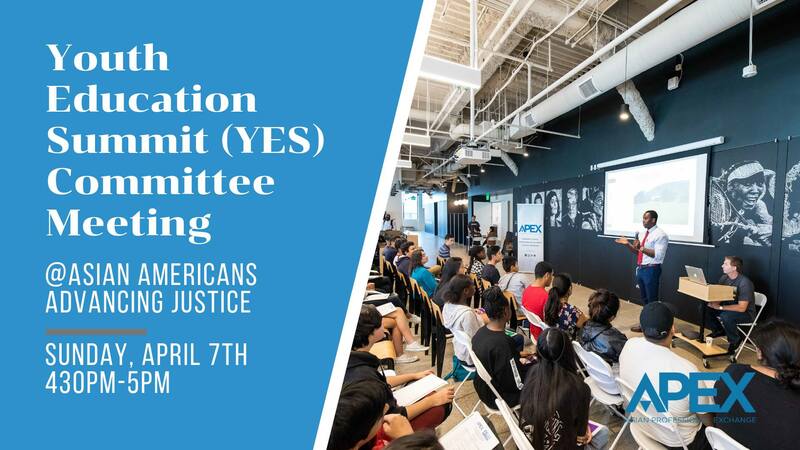 APEX Youth Education Summit – Join the Committee! Youth Education Summit is coming up in October and we need help planning this event, which is one of APEX’s largest events of the year! Come to our offices for our first meeting on Sunday, April 7th to learn more. Future committee meetings will be scheduled after. The APEX Youth Education Summit (YES) is a career day for at-risk youth (ages 14-21) to engage and explore their ideal career path. Through workshops, speaker panels and group discussions, students will have the unique opportunity to talk with and learn from working professionals across different industry fields. During panel breakout sessions, students will be able to speak with experienced professionals from different industries about their career paths. The purpose of this program is to provide an opportunity for career path development for youth by providing tools and resources for both short-term and long-term success. Moreover, as part of APEX’s mission to serve the community, YES serves as an opportunity for APEX and its members to positively impact the next generation of future leaders.